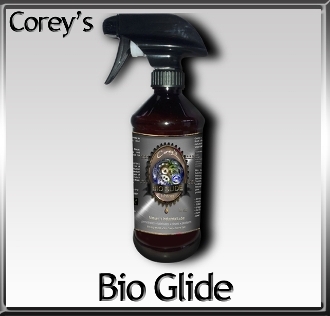 Corey’s Bio Glide is made from the finest 100% pure natural, renewable nut, vegetable oils and waxes. Bio Glide is an industrial lubricate that is free of Petrochemicals. It has been blended with the finest Bio Technical materials available. It has no breathing hazzards and will give longer lasting protection than the toxic rivals. A better, longer lasting way, to protect your objects, your health and our planet.